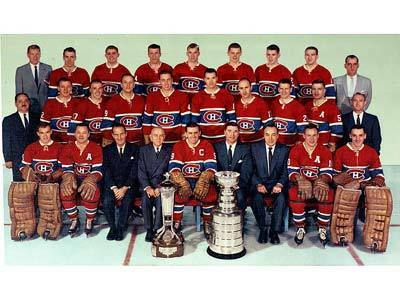 The 1960 Stanley Cup Final was contested by the defending champion Montreal Canadiens, appearing in their tenth consecutive Final series and the Toronto Maple Leafs. This was a rematch of the 1959 Final. The Canadiens would win the series four games to none for their fifth straight Cup victory, a feat that has never been matched in stanley cup play since. Montreal swept the Chicago Black Hawks in four games to reach the Final. In the other semi-final, Toronto defeated the Detroit Red Wings four games to two. Montreal swept the Maple Leafs, outscoring them 15–5, en route to being the first team since the 1952 Detroit Red Wings to go without a loss in the playoffs. On April 14, 1960, the Montreal Canadiens set a record that still stands. They won their fifth straight Stanley Cup championship. Montreal did not lose a single game in the playoffs. This season featured Jacques Plante donning a mask for the first time in the playoffs. He was able to hold Toronto to just five goals in four games, including a 4-0 shutout in game four, the Stanley Cup winner. Maurice "Rocket" Richard played in the final four games of his marvellous career, scoring the 34th goal of his playoff career during these finals. Once again, the smart money bet to go all the way, Montreal did so in the most economical fashion possible, becoming the only team to hang on to the symbol of hockey supremacy for a fifth year in a row. First round opponents, the third-place Chicago Blackhawks, had shown marked improvement over the past couple seasons but despite the presence of Bobby Hull, that year’s top NHL marksman and Art Ross Trophy winner, they are unable to win a single playoff game. 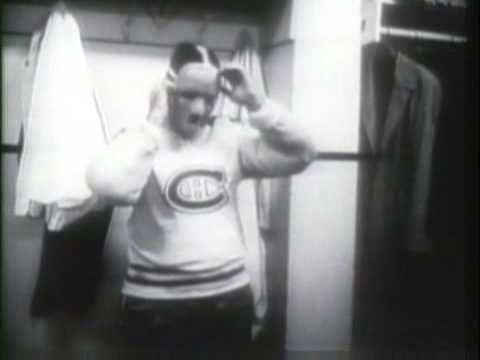 The Canadiens win the first two games at home, both by 4-3 scores, with the second game decided in overtime when Doug Harvey buries the puck behind Glenn Hall. When the series moves to the Windy City, Plante puts together back-to-back shutouts to close things out and take his team on to the Stanley Cup Finals for the 10th season in a row. Toronto is the best of the rest once again, earning another shot at the defending champions but are not able to produce a happier ending than in 1959. They are swept in four straight games by the Canadiens, who surprise very few by refusing to lose a single game en route to ending the club’s first half-century as Stanley Cup Champions. For the eighth and final time of his career, captain Maurice Richard smiles as his long-time nemesis, NHL President Clarence Campbell, hands him the Stanley Cup.